New Delhi: Siemens India will invest in developing the wind turbine production units and other engineering products in the country within the next three years. 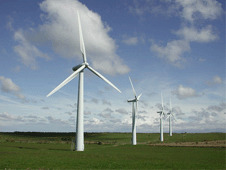 It plans to have the turbine unit either in Tamil Nadu or Gujarat and and will deliver the first wind turbines by 2012. In the first phase, the company will build a 200 MW wind turbine manufacturing capacity unit and plans to expand it up to 500 MW over the next three years with an overall investment of Rs 1,600 crore.